This was another great recipe from Carroll Cafe. Rhubarb is a great spring plant. It looks like red celery and has a very intense tart flavor when raw. I love baking with rhubarb because the tart flavor works so well in a variety of uses, like pie, bars, scones, and this crisp. This crisp uses fresh rhubarb and mixed frozen berries. However, if you have a lot of fresh berries on hand you can definitely use those. This time around I used a combination of raspberries, blackberries and blueberries. 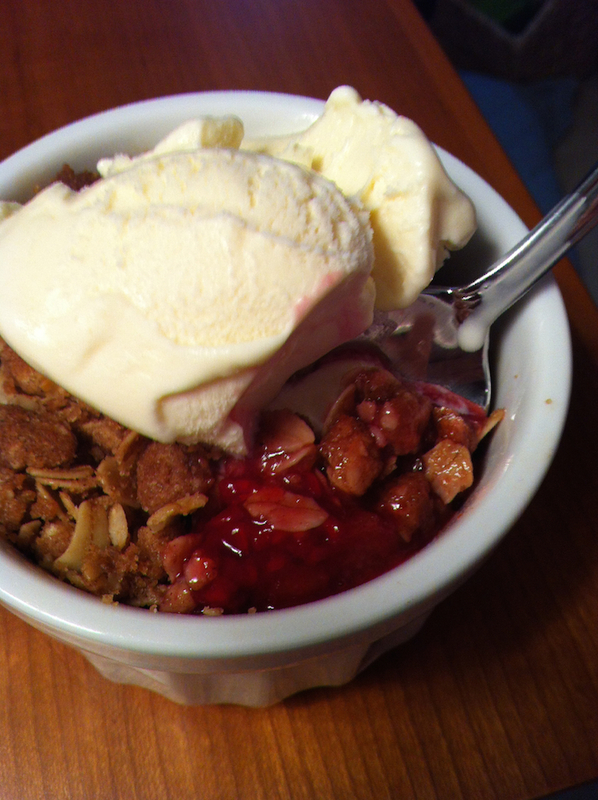 The berries are mixed with orange zest The crisp topping is fantastic on this. It’s sweet, crunchy, browns nicely and is the perfect pairing for the juicy fruits. Topped with a little vanilla ice cream and this is a perfect summer treat. 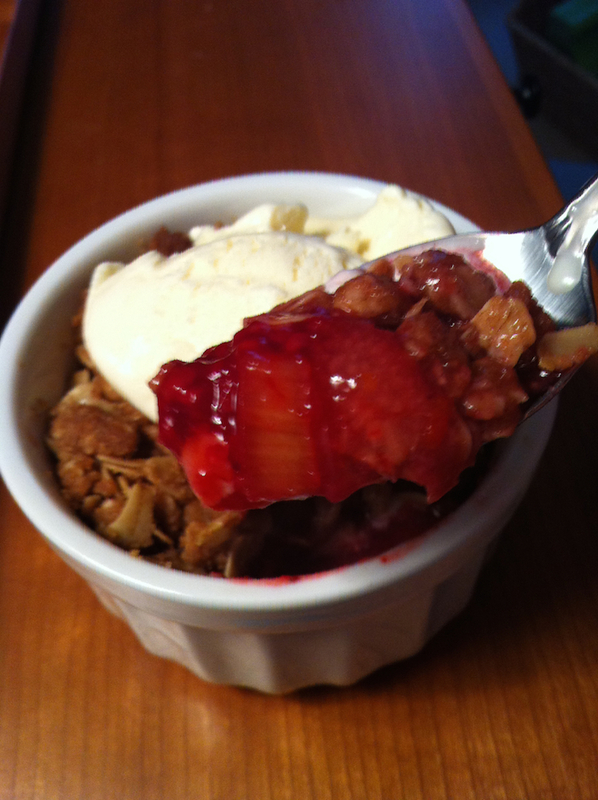 I made this in 12 ramekins, but you could also make it in a 9×13″ pan or a halve the recipe and make an 8×8″ pan. Preheat oven to 350ºF. Set ramekins, if using, on a large baking sheet, and grease with cooking spray. In a large bowl, mix the granulated sugar and orange zest together with clean hands. Add the rhubarb and frozen berries and mix well. Add the orange juice, vanilla extract and cornstarch and mix well. Set aside while making the topping. In a large bowl, whisk together the oats, flour, brown sugar, cinnamon, and salt. Pour the melted butter in and mix well with a fork. Divide the fruit mixture evenly between the ramekins, filling about 1/2 – 3/4 full. Add the crisp on top, pressing it down to fit it in. Bake for 25-30 minutes or until the crisp is golden and the filling is bubbly. If the crisp looks like it’s browning too fast, cover loosely with foil for the last 10 minutes. Let sit for about 10 minutes before serving.